I’m not sure why we were asked to speak about Family Home Evening for a Relief Society thing. Probably because I visit teach Addy and she knows I would do anything for her. Whatever. But we did speak a bit about family home evening with teenagers and kids of varying ages. We weren’t at all profound in what we said, but hopefully it helped SOMEONE. This is kind of a wrap up of what we talked about. 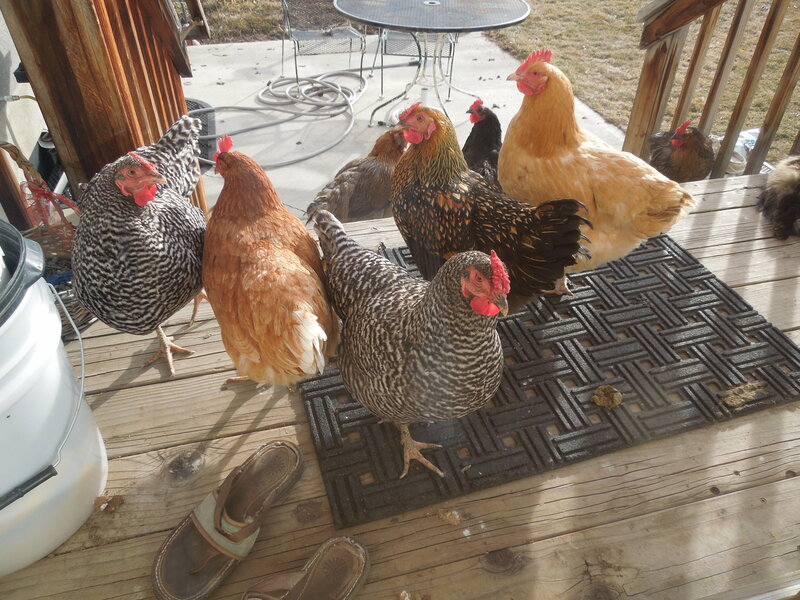 With teenagers, it sometimes hard to get everyone to stay home for FHE. Sometimes we have to adjust that. If someone is in a play or a concert that performs on Monday night, that becomes our FHE. We go to that activity to support that family member. Same with sports. I don’t like it when there’s a softball or baseball game on Monday night, but when there is, we go as a family. We had a non member foreign exchange student live with us last year. While not a member, she was a part of our family for that year. We didn’t want to preach to her about everything gospely at home, but still wanted to hold family home evening, since that’s what we normally do. After she had been here a couple of weeks, I told her about Family Home Evening, and we gathered together for FHE. We did our traditional opening, with a song and prayer. We probably sang “Popcorn popping” or something super serious like that. For our lesson, I talked about Writing in Journals, and how that’s a record that we keep for ourselves, and for our kids and grandkids. I asked the kids if they all had journals, and she didn’t have one. She had never thought about keeping a journal before, and wanted to start one. She kept that journal and wrote in it the whole time she was here, and hopefully that will be a treasure to her to have a record of her thought and feelings while here in America. Of course, our girls tend to write in their journals during church, and she quickly picked up that habit as well. Years ago we took a cruise that turned out to be a bit less than the perfect vacation. The Norwalk virus had us all quite sick for about two days each. One day we disembarked on an island (I can’t even remember what it was, something like Cabo?) we were dragging, tired, and just barely not sick. We also didn’t have enough cash to even pay for the girls’ braids, but that’s another story. At that time, I remember starting our family cheer. Now we tend to do the family cheer on vacations and family home evenings. Group Family Home Evenings- Ryan’s family had a tradition of meeting once a month as an entire family for FHE. We would rotate the who was in charge of lessons and snacks. Most of the time we met at Grandma and Grandpa’s house, but sometimes we would rotate. Some times we had a family pool party or a barbeque, or an activity. The kids got to see and interact with their cousins and hear testimonies of the gospel from family members…not just their parents. –The kids would be happy if we joined a bowling league and went bowling every week. That’s always the activity they want to do together, even though we don’t go very often. -Let the kids teach the lessons. Sometimes they are working on something for Faith in God, scouts, or personal progress that requires them to teach something. This is a great opportunity for them to teach the lesson or part of the lesson in FHE. –Use church magazines. Sometimes we end up just reading and discussing an article from the Friend or the New Era, or watching a video clip from lds.org. –Sometimes around birthdays we have a lesson honoring the birthday person and why we value them. –Some of our FHE nights in the summer are family weed nights, yard work nights, or we go for a walk or a bikeride to a nearby park. –Don’t be afraid to be silly. We want our kids to ENJOY the time spent with the family, and have fond memories of FHE, even if they never remember a single lesson that you teach, they’ll remember that time you played hide and seek in the dark, or played the silly game where one person is the arms for another person. –Just do SOMETHING together as a family, and be consistent about it. Call it family time, call it Time out for Family, or call it FHE. Just as long as the kids know that family is important enough to get together. And when you do, no matter what contentions there are before or during the lesson, y9ou will have added peace as a family AFTERWARDS. 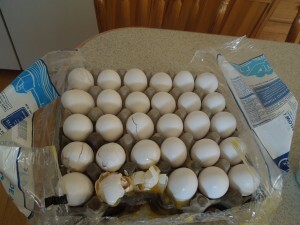 At the grocery store today, I came across a 5 dozen package of eggs that was slightly damaged. Two packages, actually. Can you read that price there? 25 cents. Normally I don’t buy eggs at the grocery store, since we have 11 chickens who are supposed to be not just entertaining us, also laying eggs for us. 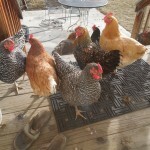 By supposed to, I mean that they are each laying one egg about every other day. So, we get around 4-5 eggs a day. 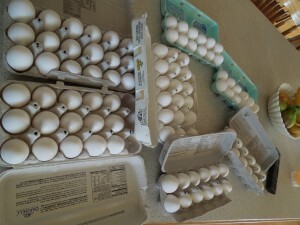 Which is enough for us, and extra to sell a dozen or so a week to my friends who love fresh eggs as much as we do. If everyone were pulling their weight and it were warmer, we might get 9-10 eggs a day, and could therefore sell or give away more. 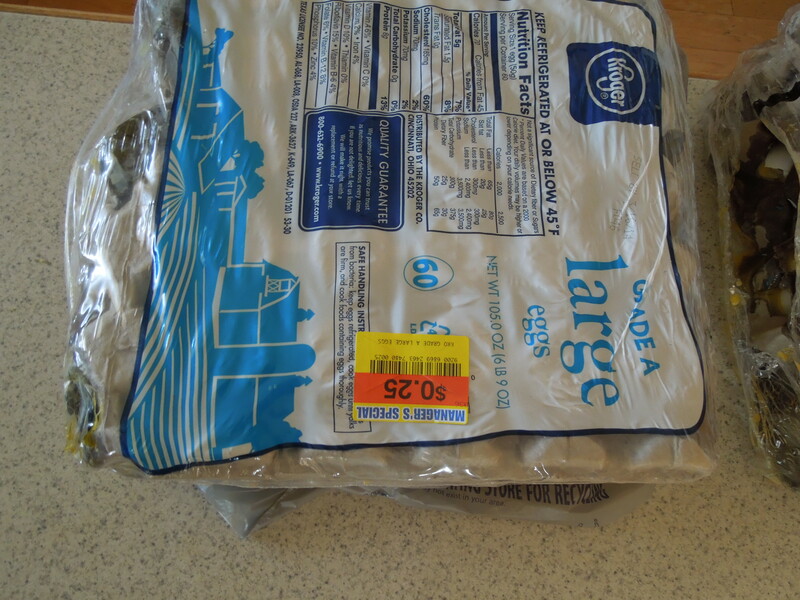 But for a total of 50 cents, I got a whole lot of eggs. Of course, some of them were broken, and I had to wash them all to get the egg goop cleaned off of them, but I am used to washing eggs, and I have no trouble throwing the broken ones away. We don’t often have white eggs. And, I have lots of spare egg cartons because people that I give eggs to will often save their cartons, so I just washed them, and put the cute little white eggs into new cartons. When they were all washed and put away, I had about 8 and a half dozen. For 50 cents. I don’t know WHO you are, but that’s a bargain right there. 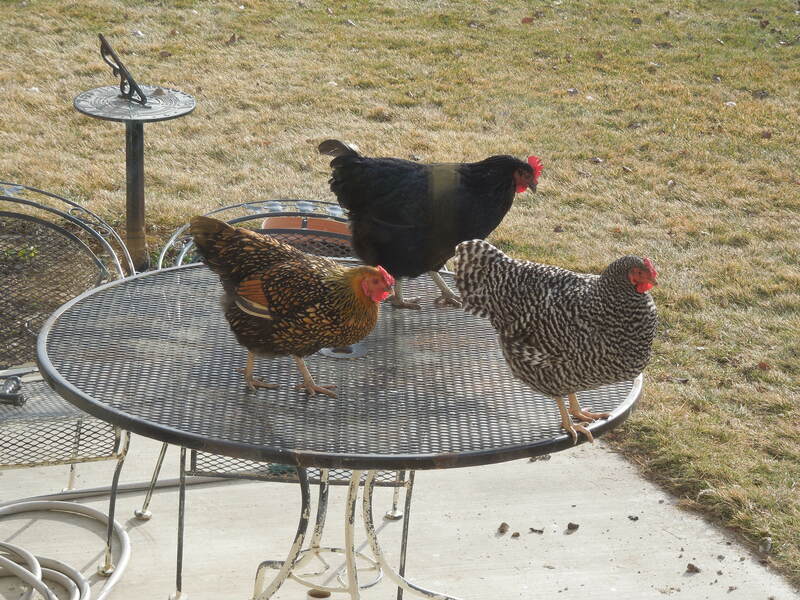 So, I’m going to get crackin’ (literally) and we’ll have eggs for dinner tonight. Just don’t tell the girls that they didn’t come from them. My husband gave me a shower head for Valentine’s day. Uh-huh. Yes he did. Installed it, too. Now that’s what I call a gift. For a few weeks our shower has been kind of dribbling. Not great. I asked him if he knew what was wrong with it, and he did not. That shower head has been working hard for over 12 years, so I guess it got tired. Instead of buying a new shower head, however, my husband pulled one out of the boxes under our bed, and gave it to me. Instant gift. What? Why do we have a shower head under our bed? We have a lot of neato shower parts in boxes hidden around the house. You see, several years ago, a certain shower maker wanted to partner with Ryan’s company and do a really cool automated shower. Somehow Ryan was the guy, and we got a whole bunch of shower stuff delivered to our house. Where is the really cool shower? In boxes. Ryan didn’t want to demo the bathroom and redo the whole shower, especially not when we were trying to work on the basement. So, in the boxes it sits. Until now. Now I have a really cool shower head that does multiple functions. Like a hotel shower. And the cost? FREE. Better than flowers in my opinion. BUT, the next night, we got all dressed up and went to a Ball. Yes, that’s right, a BALL. A Regency ball. Where people dress up in their best Pride and Prejudice era garb and eat fancy food with the right forks and all that. A friend of ours was turning 40 and wanted to throw herself a ball. She LOVES stuff like this. Well, it wasn’t exactly her birthday, but Valentine’s weekend, instead. They hosted this party at the White willow Reception center in Provo. Everyone came dressed up. Some rented their clothes, some used what they had at home, some borrowed. It was so much fun. Here I am sipping my juice. Elegant, right? After dinner, there was even dance instruction and some dancing, and fancy desserts. Ryan had to try on my gloves. I think he’s doing a magic trick or something. There was even a photographer there taking pictures of us when we came in, and then candid shots throughout the evening. I can’t wait to see those. What a fun way to celebrate Valentine’s day! I’m so glad we got to attend. 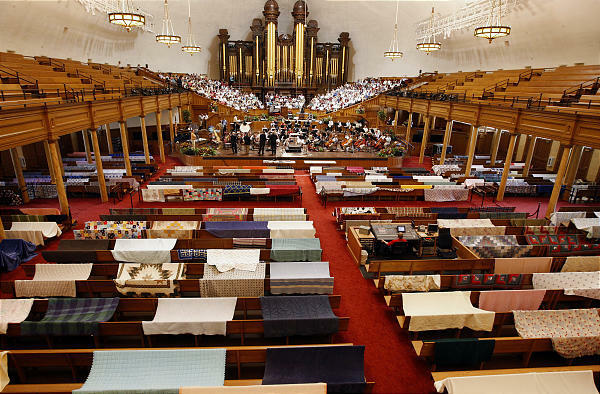 This week the Bells on Temple Square got to be a part of the recording process for an upcoming Mormon Tabernacle Choir album. We’ve only ever been on the Christmas CD, so this was a new experience for us. The choir and orchestra doesn’t fit into a traditional studio, so they make the Tabernacle into a recording studio. There’s a great article about all they do to eliminate extra noise like the hum of the drinking fountain or the buzz of a smoke detector when recording I found from the Deseret News in 2008. We memorized our song, and since we couldn’t rehearse in the tabernacle, we set up our rehearsal in the North Visitor’s Center. So cool to walk through the visitor’s center to a theater and find our tables all set up for bells. It was a little dark in that space, but we could still rehearse. When they needed us, we took our bells over to the tabernacle, and silently climbed the stairs behind the choir loft. At the signal, we made our way along the balcony seats and stood right at the edge of the balcony on both sides, as close to the orchestra and Mack Wilberg as we could be. As we played our part, we worried about staying with Mack’s beat, yet not being ahead of the choir. Not sure if we were right on, since we are above and in front of the choir, we listened carefully to direction. Ryan Murphy was back in the sound booth listening carefully to each take. They do not record a whole song all at once, rather go over each section, sometimes even a few measures over and over to correct each inconsistency and fix any errors. While we were there, we heard them complaining of ONE tenor voice standing out. “We didn’t have this problem yesterday, men, so fix it. Have you moved seats or changed anything since then?” Mack said. We were there for almost an hour between the waiting for our turn and playing our parts over and over. Not hard work, but my hands hurt from not being able to put down the bells or change them (especially my right hand that had two bells in it). We were just excited to be a part of a recording, and thankful that we were invited! It’s just one song, and not even the whole song, but we can add that to the many Christmas CD’s we have played (I’ve been on 8 of them) I’ll be sure to let you know when this recording becomes available. We’ve got some of this going on here today. If you can’t tell, that’s camera equipment. They wanted a bedroom with blue walls. 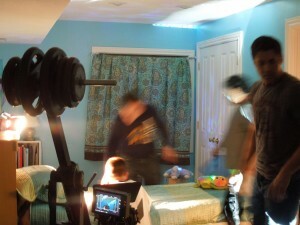 I sent them pictures of Megan’s blue room, and they chose to come here to film. So I had Megan clean like the wind. Actually, she just cleaned regular, but I had her put EVERYTHING away. 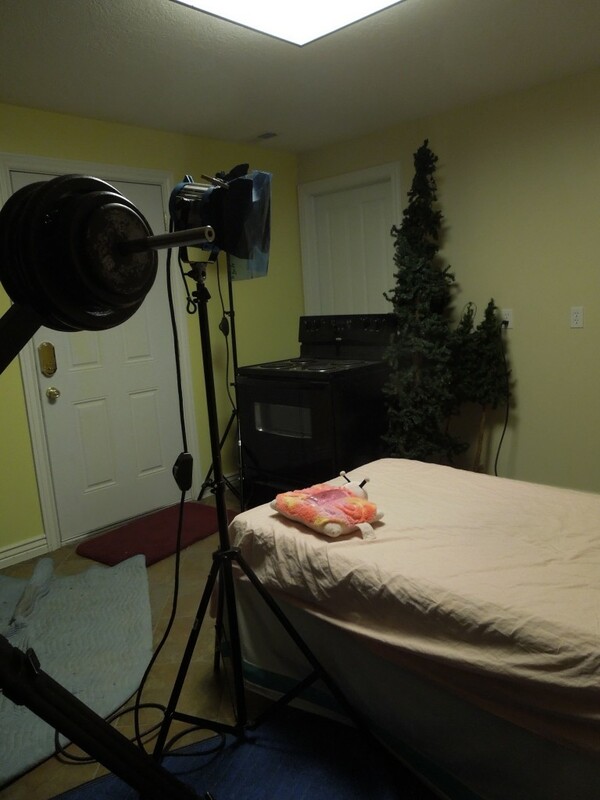 I’m glad I asked her to do that, because they have moved her room all around to arrange the shot. Her room is not that big, so they ended up moving her dresser out in the hall, moving her desk, etc. What’s the product, you ask? It’s Dreamlights, the stuffed animals that can project images on the ceiling. The director didn’t like that we have can lights, as they are shooting images of the ceiling, so we looked around the house to find other areas that might work. (Might I add that not all the other areas had been cleaned? I’m adding that). I took the director up to John’s room (which also has blue walls) and he even looked at Natalie’s room (which has these greenish blue walls that I do not like, and it needs to be repainted. Because every time I look in her room I am reminded that eggshell paint is not the same as semi-gloss paint, and how could I make that mistake? Anyway, he said that Natalie’s room would work, that it’s big enough and they could just shoot a certain corner and get the ceiling. We also looked at the kitchen area downstairs. It does NOT have can lights, but one light in the center of the room. They thought that might work. 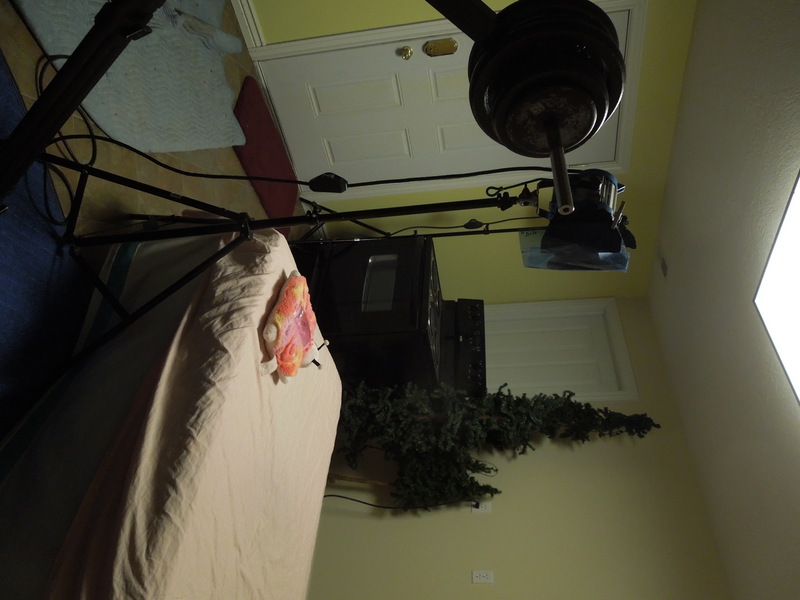 After they filmed some shots in Megan’s room, I went to take a peek and see if they needed anything else (they had asked for pink blankets, which lucky for us, I have three girls, so we DO have some pink things around), and saw that they had now moved to the kitchen area of the basement. They just took Megan’s mattress off the bed and moved it into the kitchen. “Wow!” I said, as I came down. “Don’t worry, we’ll put all this stuff back”, said my neighbor. I don’t mind that they have moved things. 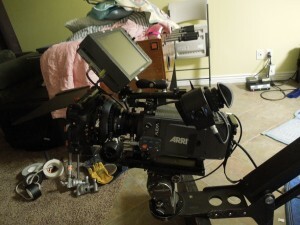 They are paying me to use the house for the shoot, and if they want to move things, that’s fine. Just different, right? I love how they just moved the stove and the few random Christmas trees that were down there, and pushed them to the side. I did tell them that they could move anything they wanted, so it’s all good. The foosball table hold extra blankets. A different boy came later, and they realized they needed a red shirt for him, so that he looks just like the boy they already used in this commercial. No problem. We have a red shirt somewhere. (I had to search through a couple kids’ clean clothes baskets to find one, but I found one, thanks to Hope of America). Pink Blanket? No problem. Blue blanket? No problem. 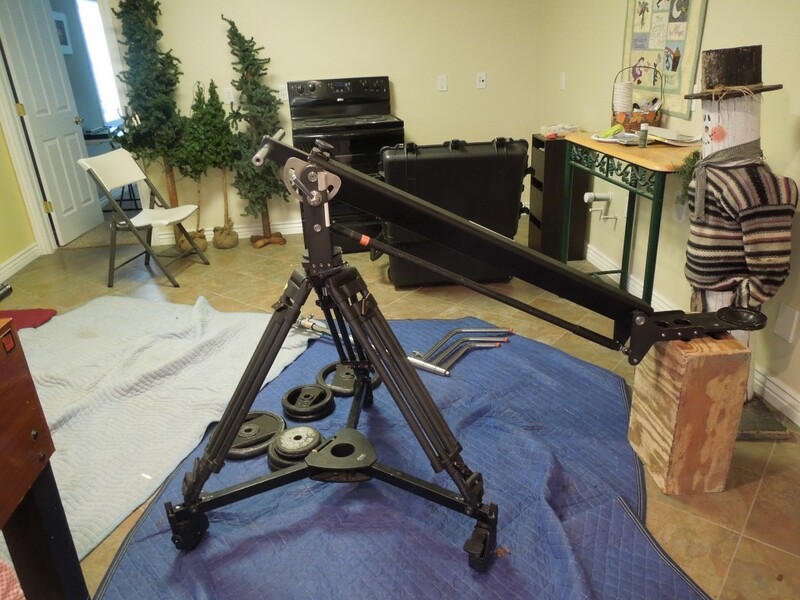 Oh, and I ran up and cleaned the pile of clothing off of Natalie’s floor and vacuumed, just in case they decide they do need to film up there, too. After a couple more kids came, they decided to use Natalie’s room. They want it to look like several different locations. 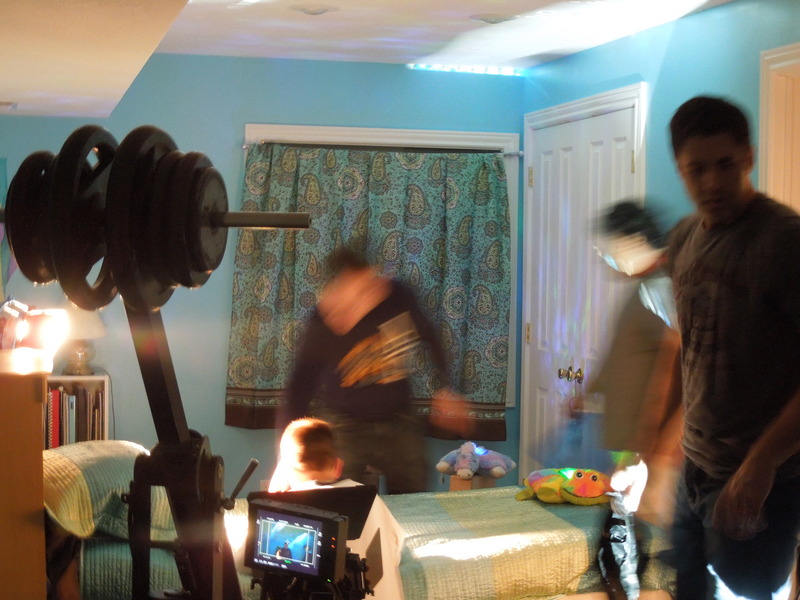 I only peeked in while they were setting up that room, but it looked like they were just focusing on the boy on the bed and the ceiling and wall behind him. It meant a lot of carrying stuff all the way upstairs. 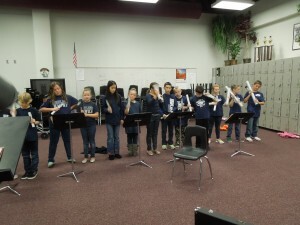 I just got back from taking 18 of my 3rd-6th graders on a little performance field trip. We played the National Anthem at American Fork High for a basketball game. Why? Why? Why do I bring these things upon myself? There are several reasons, none of them seem all that valid right now, when I’m tired. Tired of the kids and just tired. 1-After we played the National Anthem at Lone Peak’s basketball game in December, the kids were SO excited. They felt like they were the most important ‘musicians’ in the world when they got that huge applause. I want them to have that kind of experiences with music. 2-We had already learned the song, so it wasn’t that much rehearsal to just adjust it for the few kids that are new this semester. I felt like since we had already put so much work into the song, it would be a waste not to play it again. 3-I want to share the love of handbells and handchimes. Most people who go to a basketball game haven’t seen or heard anything like this before, and so we want to share our art. 4-I may be trying to prove to myself or anyone who cares that I can actually do this job of teaching a chime choir. Maybe. This time, at least, it was only ONE game. 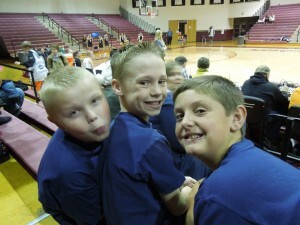 When we played at Lone Peak, they had us play for the girls’ game at 5:30, then play for the boys game at 7:00. This time it was just one game, but we still had too much time. I had everyone meet over at the school too early, and we had too much time to kill. 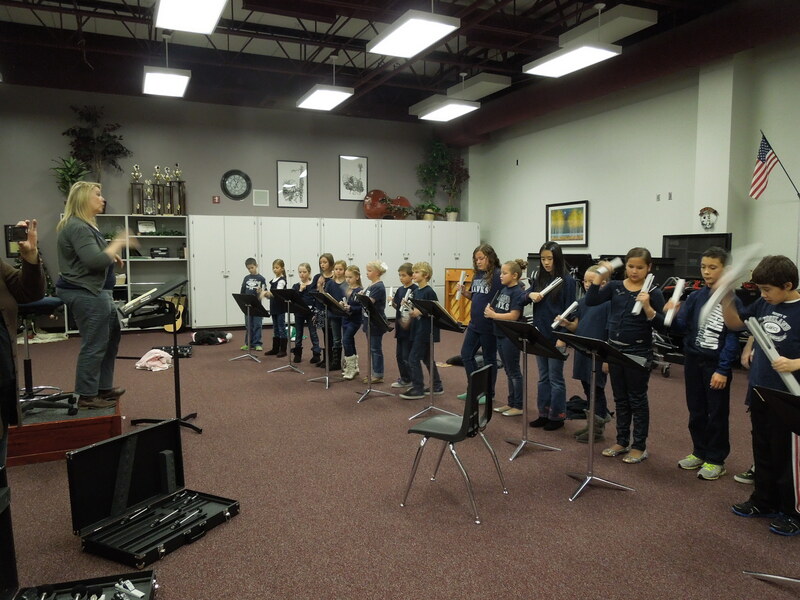 We found music stands, rehearsed our song a few times, but don’t want to overrehearse, so we played a little game, then got ready. I told the kids if they wanted to do more fun stuff like this, they would be ABSOLUTELY silent in the halls. We had to go around the auditorium (where they were just starting the school play) go outside, and around to the gym door. Try keeping the kids quiet through that! They actually did GREAT. 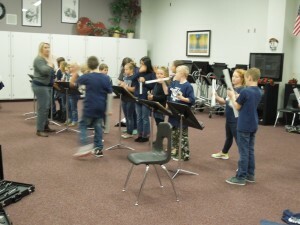 The song sounded nice, and even though they were nervous, they played well. Two people stopped me on my way out and said, “That was amazing!” The second one was a cop, who put his hand on my arm. I thought I was in trouble, but he said, “WoW! They did GREAT! I guess that’s why I do it. Afterward, we traipsed back outside and around to the music rooms, put the chimes back in the boxes, and hauled them to the car. I brought four noisy boys home with me. And my hubby just brought me a shake, and it tastes yummy and feels great going down my throat. I can feel proud of a job well done. I can feel good that I got those squirly kids to calm down long enough to learn and perform our national anthem, and hopefully they are learning a thing or two about music along the way. It’s tax time here, and Ryan has been dutifully working on the taxes. He had everything pretty much done, and was waiting for my w-2 from my substitute teaching last year. Hmmm. I didn’t teach at all during fall semester, and I really didn’t teach much last spring, either, so I knew it wasn’t going to be a big number. BUT, if you read this article here, it paints a different picture. ” According to the U.S. Census, there were 5 million stay-at-home moms in 2010 — down from 5.1 million in 2009 and 5.3 million in 2008. Thankfully, my husband has never criticized my choice to be a stay at home mom. Even as the kids are getting bigger and in school all day, I haven’t felt pressure to work outside the home. I work because I want to work, and I take care of my family and do the laundry, grocery shopping, coupon clipping, piano lessons, making dinner, homework helper, etc. because I love my family. So, there, taxes. I may not have brought in a bunch of money, but I support and help the one who does, and that is worth it. At the beginning of the year I picked a one word goal that expresses what I want to work on this year. It’s time for my monthly accounting. Am I less? Have I spent less? Do we own less? We did ok in the fight against clutter. A trip to DI took several bags and boxes of stuff that we decided we didn’t need. A friend was also doing a clothing drive, and we contributed three large garbage bags to her stash, but once the Christmas clean up was over I haven’t been as good at getting rid of things. Ryan has cleaned up his office and gotten rid of a significant amount of junk, and I did some serious work in my office clean up as well. It’s fun when we can actually give something away. Last week I went to help a young mother in our ward who is going to be on bed rest. She needs help taking care of her two little ones, and before I went, I grabbed a stuffed monster out of our ‘donations’ bucket. The kids might enjoy this, I thought. Sure enough, it was a nice ice breaker to give them that monster as something they could play with, and maybe it helped make me not seem such a stranger. I go again tomorrow, I’ll have to find some other toy that we were going to get rid off. Less me. 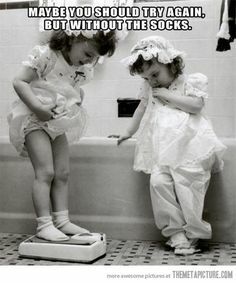 Well, I seem to have lost about five pounds this month. Trouble is, I gained back four of them. Sign. So I failed at that this month, enough said. Spend less. We have been working on our budget for three months now. It’s not hugely restrictive, but it IS a budget, and we aren’t used to working within a budget. I never realized how much I was spending when I went to Walmart or the grocery store, but those seemingly little purchases were really adding up. Now I stick to my monthly household budget, and when it’s gone, I have to dip into my personal money (there’s not much in there, and I certainly don’t want to use it for groceries). I’m learning to shop the sales, use coupons, and only buy what we NEED. We still have SO much food in our pantry and storage that we’re not every going without, but we are trying to use what we have. And only one trip to Costco per month. There’s no running for fast food, either, unless it’s planned. One of the biggest thing I’ve noticed is that I’ve not stopped for lunch very much. I do have a few lunched out with girlfriends, but I only hit the Wendy’s drive through once in January, and when I did, I had a coupon. So, that’s progress. Well, at the beginning of February, we were able to pay off our car loan. If we had continued paying only the regular payment, we wouldn’t have had that thing paid off until well into next year. But now it’s paid off and we can put that money toward a different loan. I am really pleased with our progress so far, and hope that we can continue this budgeting thing. It’s fun to see how many things we can do for free, or little cost, too. I’m always working the radio contests, but there are other things as well. A friend on facebook posted that she had comp tickets to her show that night, and because we didn’t have plans, I was able to take my daughter to the show for free. Studio C taping was free. Lady Antebellum concert was free because I had won the tickets. So we can see how far we can stretch that entertainment budget. No, we’re not crazy budgeters who live on $100 a month for groceries (although I have tried that and it was almost possible), but we’re not going to be shelling out for the expensive valentine’s candy, either. So, it’s a good start. Except for the exercising thing, I feel pretty good about our progress. And, it’s a new month!